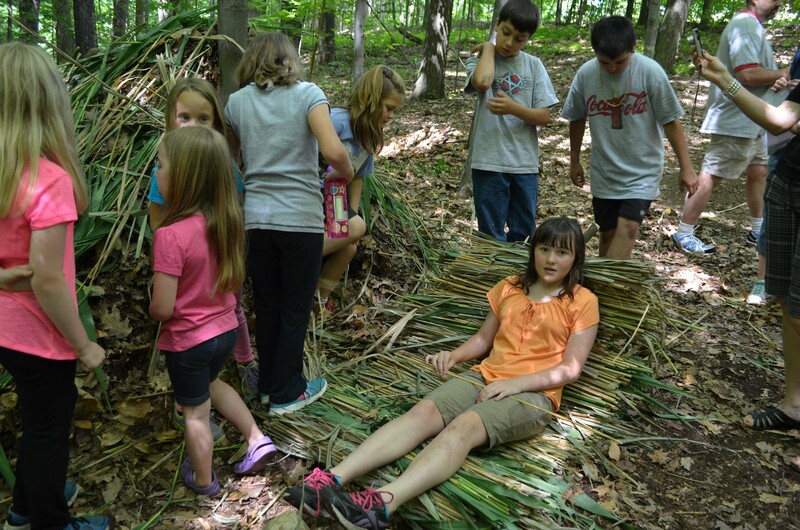 My daughter, Lauren, 10, spent last week making rope out of bark, building a fire with one match, foraging for edible plants, and creating a shelter with leaves, mud, sticks, and phragmites. No, I didn’t drop her off in the woods, cackling “fend for yourself, baby girl.” (We’re only two weeks into summer break so I’m not that sick of my kids yet. Talk to me in mid-August, and I may sing a different tune). She attended “Surviving the Outback” class at Penn State Behrend’s College For Kids. 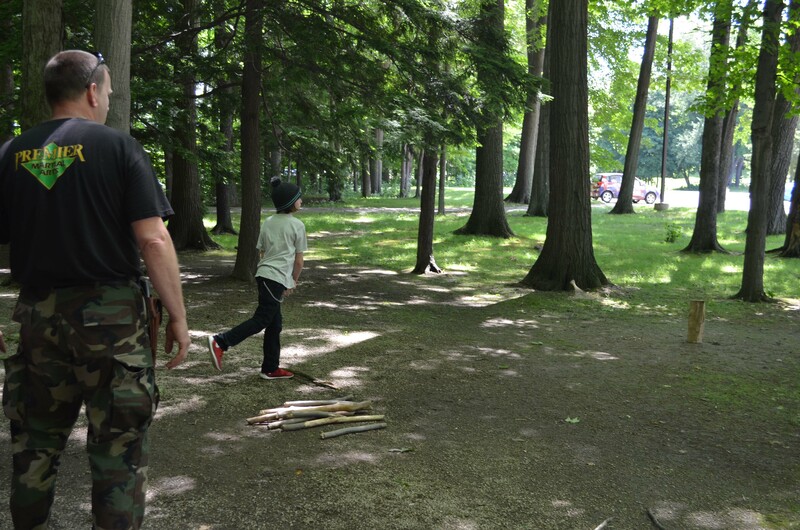 On the last day of class, the instructor, Tim Lucas, a survivalist and owner of Premier Martial Arts in Erie, invited parents to see what their kids (ages 8-12) had been learning and doing all week. When it comes to survival in the wilderness, your four priorities in order of importance are: shelter, water, fire, and food. You can live for two weeks with just shelter and water. 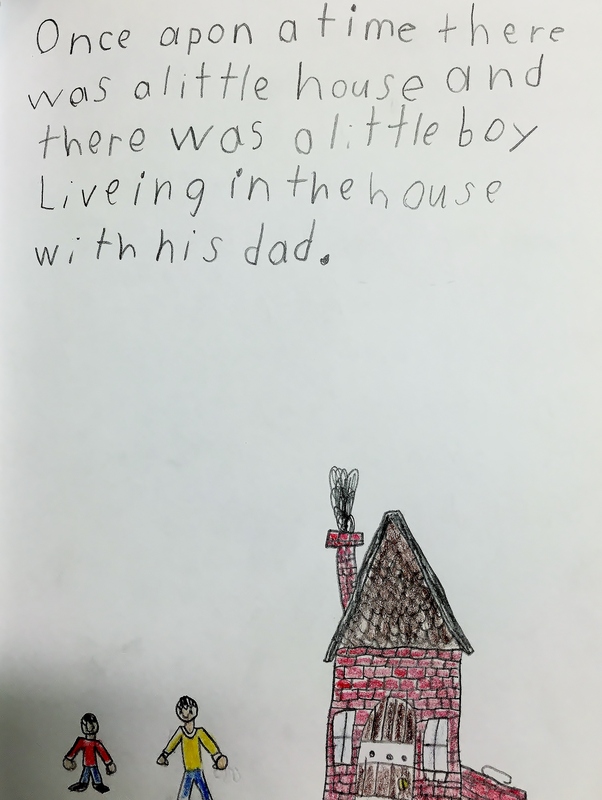 “Shelter is most important,” Lucas said. “You’ve got a couple days to find water and weeks to find food, but exposure can kill you quickly.” According to this site, you can live without shelter for three hours, without water for three days and without food for three weeks. Jewelweed, a common Pennsylvania weed, is a great poison ivy cure. If you’re exposed to poison ivy, crush the jewelweed in your fingers to make a pulpy mash and cover the poison-ivy exposed skin with it. More on that here. 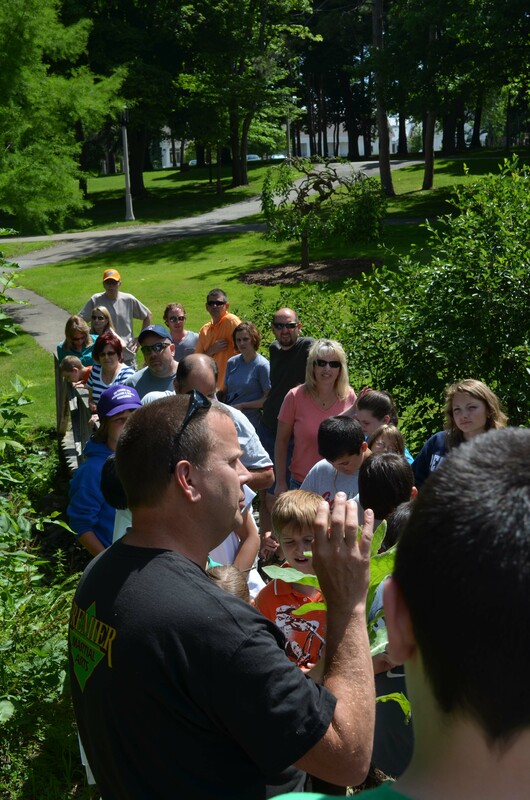 Cattails are one of the most valuable plants for survival. They provide not only food, but also tinder, insulation, and shelter material. Aside from a sharp knife, one of the most useful tools for wilderness survival is an arm-length, wrist-thick throwing stick. 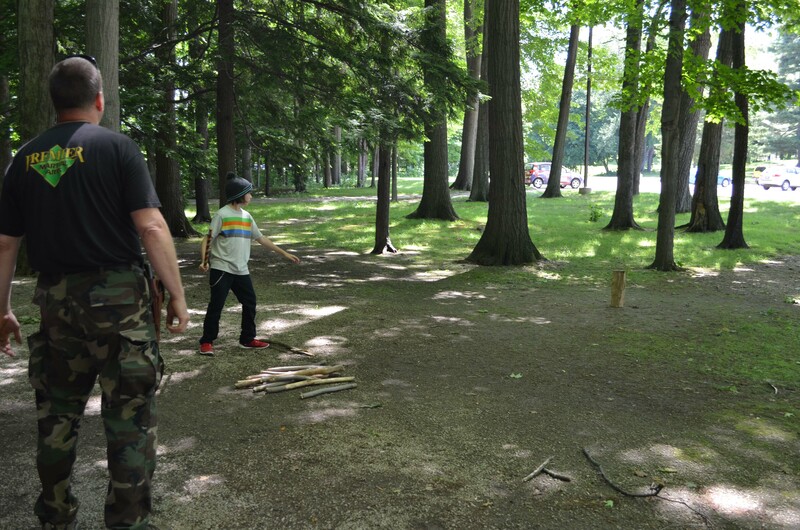 Properly thrown sticks can be used to take down a small animal (raccoon, rabbit, etc.). 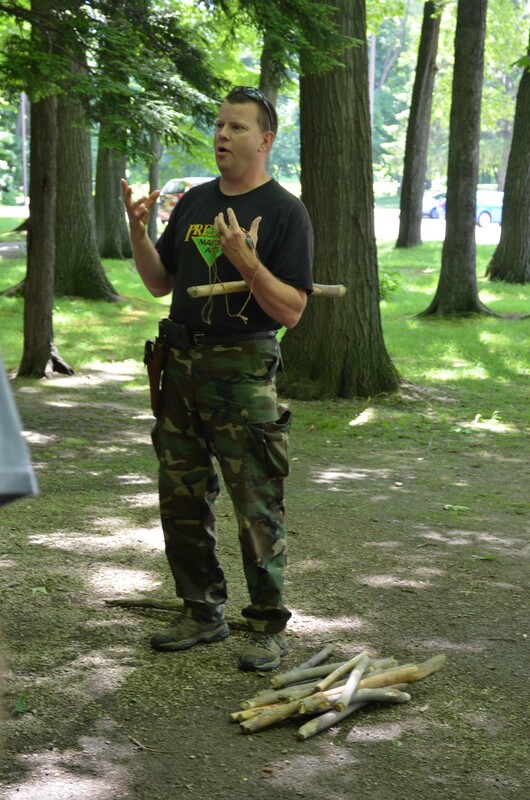 You can make twine/rope/cordage using the bark from dead trees and using your fingers to shred and twist it. “Look for trees with dead bark, and strip off long sections of the softer layer between the wood and the outer bark,” Lucas said. Phragmites, cut and bundled, make great sleeping mats, blankets, chairs, and shelter cover. When building shelter, be sure to put down a thick (several inches) layer of leaves (or phragmites) to separate your body from the ground, which can get very cold. Build a fire ring with an opening toward you/your shelter to conserve and aim the heat. The stones should be nose high when sitting in front of it. Daisies and clover are edible not just for rabbits and deer, but for humans, too. In fact, many wild plants are edible. So what are your kids doing this summer? 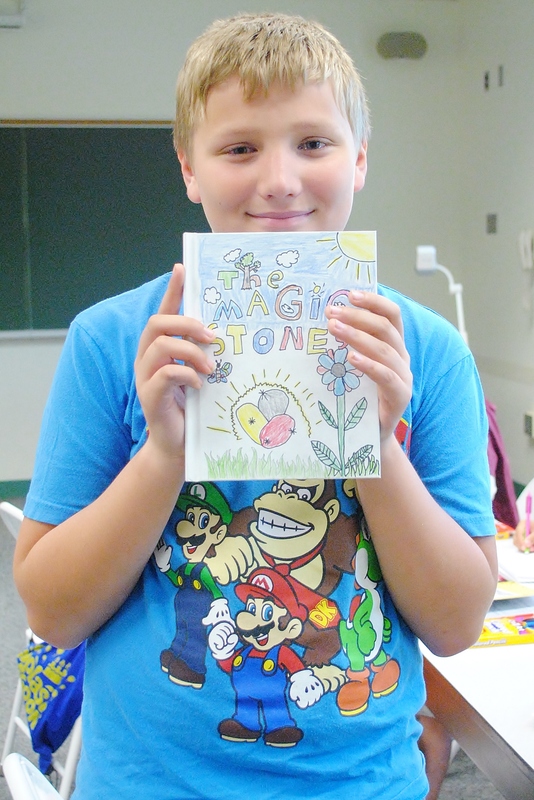 There are still openings in many exciting, fun, and educational (don’t tell the kids that though) classes at College for Kids (Click on the registration link to see which classes still have openings) Who knew summer school could be so much fun? Demonstrating their throwing stick skills. My daughter, Lauren, in the phragmites chair outside the shelter. 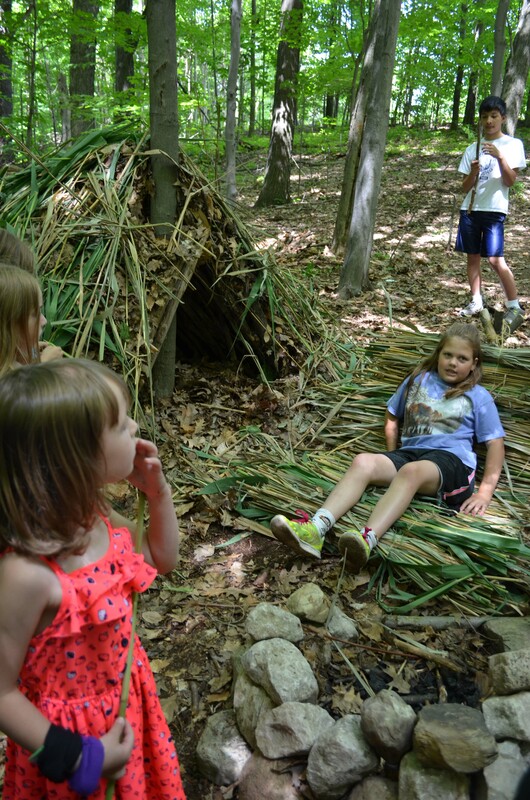 Mud, grass, leaves, phragmites and more were used to build the shelter. Notice the stone fire ring with the opening pointed toward the chair/shelter, too.